Students will turn and talk to a partner about a book they love and share it with that peer. Mrs. Downs will be sharing a book talk of upcoming Author's who will be at Reading Fun Night. ​A discussion about about how reading adds to the value of life through: learning new things, learning how to have empathy, experience places, things, situations, that couldn't otherwise experience, helps us become imaginative, expressive and better communicators- helps us develop our overall character. K-2 will learn/review that answers come from a variety of resources. They will generate questions they have about Thanksgiving and use the resource of books to find answers. 3-5 will be playing a "minute to win it" version of quick research. As partners they will have to do a search for a keyword and find a the book on the shelf for that topic. Then they will select a book bag to find 3 essential questions from and see who can do it the most effectively. ​We are beginning our unit on research, and each grade level is learning different concepts within these research activities. Kindergarten will be learning about INDEPENDENCE. We are starting this unit by first discussing what independence feels like and looks like. Students will have the chance to talk about examples they can think of that illustrate independence. 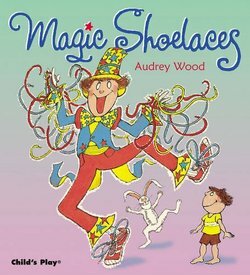 Then we will read the book Magic Shoelaces as we discuss the importance of knowing how to tie your own shoes by yourself. Students will be learning in library how to tie their own shoes, independently throughout this unit. 1st grade will begin learning about CLASSIFICATION. Students will be given the opportunity to learn what classification is by sorting objects. After they have had a chance to sort these objects the class will talk about how they "knew" what to sort and how that is classification. Students will begin learning about clouds and how different clouds mean different things for weather patterns. There is a lot of learning through observation in this unit. 2nd grade will be learning about the concepts of INTERACTION, HABITAT, and BEHAVIOR. 2nd grade students will be "visiting" different tables to look at animals from 6 of the 7 continents. They will have a map where they will write the 2 favorite animals for each continent down. Throughout this unit students will research and study one of these animals and make a puppet to teach the rest of the class about these concepts for each animal. 3rd grade will be learning the concepts of CULTURE, HISTORY, and TRADITION. They will be perusing a variety of books of countries around the worlds to choose the top 3 that are intriguing to them. As they select their country they will be learning about these concepts and will come up with a presentation to share with the rest of the class. Next, 4th grade is diving into the concepts of GEOGRAPHY, IDENTITY, and DISCOVERY. These students will be discussing how knowing more about the state of Utah will help us in learning about the concepts. They will look through www.discoverutahcounties.weebly.com and looking at some selected counties to see which are appealing for them to learn about. They will then share a presentation about how these concepts were discovered in the county they selected. Last, but not least, 5th grade students will be learning about VALUES, CHOICES, and CITIZENSHIP as the have the chance to explore a variety of biographies searching for someone who would belong in the Providence Hall 5th Grade Hall of Fame. Throughout this unit the students will learn about the person of their choice and will try to convince the rest of their class, through presentation, that they are worthy of being placed in the Hall of fame. Students in the class will vote on each presentation for those that exhibit the IB learner Profile and attitudes as well as demonstrating positive citizenship and worthwhile choices. Kindergarten will finish reading Magic Shoelaces this week. Students will make predicitions throughout the story about how becoming independent is a positive choice. 1st grade will be sharing questions they have about the weather. Then we will classify those questions by similiarities. The next week students will help decide where to access this information. 2nd grade will continue looking at books choosing animals from different continents that they would enjoy learning about. 3rd grade will be looking at the top countries they chose and will be rating them in order of their most favorite to least. We will discuss if students are wanting to do individual projects or work in pairs. Next, 4th grade will be looking through www.discoverutahcounties.weebly.com and looking at some selected counties to see which are appealing for them to learn about. Students will be exploring in partnerships and choose their top 4 favorites and rank them in order of top favorite to least favorite. Last, but not least, 5th grade students will be exploring a variety of biographies searching for someone who would belong in the Providence Hall 5th Grade Hall of Fame, someone that contains IB traits and values, made a choice that had a positive affect on many people, and that exhibits positive citizenship. We will be taking a break from research for all the classes that are caught up, the rest we will get caught up so that when we return from the break we can JUMP INTO RESEARCH! 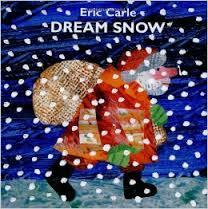 ​In Kindergarten we will be reading Dream Snow by Eric Carle. They will be able to describe in detail, characters, setting, and plot. 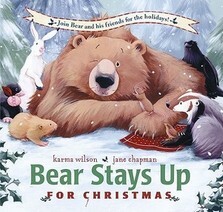 ​2nd grade will be reading Bear Stays up for Christmas by Karma Wilson. ​They will be able to describe in detail, characters, setting, and plot. 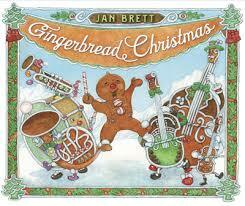 ​3rd grade will be reading Gingerbread Christmas by Jan Brett. 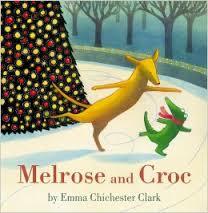 ​4th grade will be reading The Little Drummer Mouse by Mercer Mayer. They will compare and contrast the relationships among characters, setting, events, etc. Hopefully we will all return refreshed and ready to learn!! Kindergarten will spend the day generating questions they have about how to tie shoes, these will guide our research and resources we use. 1st grade will begin using the resource of books to find the answers the questions they generated before the break. We will use the tools in books to find answers to the questions we have quickly and efficiently. 2nd grade will begin generating questions about animal interaction, habitat, and behavior. Afterward students will be divided into contienet teams where each student on that team will become an expert on the animal info of the animal they chose before break. 3rd grade will begin generating questions about culture, tradition, history of a country they selected before the break as well. 4th grade will be put into partners according to the counties they seleceted as favorites and will come up with the rubric for the geography, identity, and discovery of the counties in Utah. 5th grade will be shifting gears and begin prep work for exhibition. The month of January we will be discussing and looking at local and world wide issues and discuss what kinds of action could take place to make the world a better place. This is apart of their Where we are in place and time unit. Kindergarten students will attempt to tie shoes on thier own. After a bit of a try the students will move over to the computer area and see some videos that answer their questions they asked from last week. If time permits they will try again with the additional information. 1st grade will continue to use observation and books for answering their questions. 2nd grade students will be divided into continent groups and given one of the animals they chose to become the expert on that animal. Students will help create the rubric of questions for everyone to research. 3rd grade will be placed in partners, chosen by the countries they prefer, and will help finish making the rubric of requirements for their presentation. If time permits they will also help in creating the rubric for partner work. 4th grade will be placed in partners, chosen by the counties of Utah they prefer, and will help finish making the rubric of requirements for their presentation. If time permits they will also help in creating the rubric for partner work. 5th grade students will be working in groups of 5 and reading an article on issues that affect elemantary students. They will work as a group to come up with some ideas of how to resolve the issue they read about.